"I dropped my pants in a tattoo parlor in Amsterdam. I woke up in a water bed with this funky-looking dragon with a blue tongue on my hip." 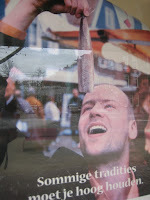 Unlike Ms. Jolie, I always remain fully conscious when visiting Amsterdam. I go at least once a year. Drugs and debauchery are big attractions for some. But there are plenty of other good reasons to visit the city. First of all, my father was born in Amsterdam. I have many relatives there. And those are reasons enough to go regularly. Then there's the food. After so many visits, I've developed something of a routine when it comes to eating and drinking a few beers. In my head, there's an eclectic list of things to do. Topping that list of favorites is Indonesian food. My grandfather spent his boyhood in Java where his father was building railroads. A taste for this country's cuisine runs in the family. If you ask any of my Amsterdam relatives where to get the best Indonesian rijsttafel (rice table), they all have one answer: Tempo Doeloe on Utrechtsestraat. It is very popular and booking is a must. I've been there, but we always go somewhere else. For us, the most fun is Sama Sebo. We love the informal style and atmosphere. Here's how it works. They take reservations for the small restaurant. 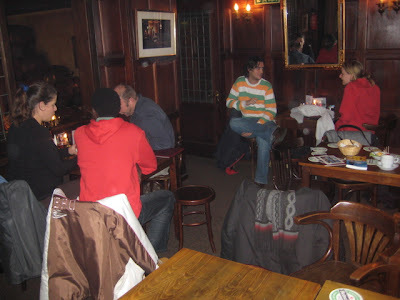 But we prefer to sit in the more lively, but equally small bar area, Cafe de Posthoorn, where reservations are not accepted. We try to show up at an early hour, maybe 6 pm. If there is a wait for a table, the waiter will put your name on a list. 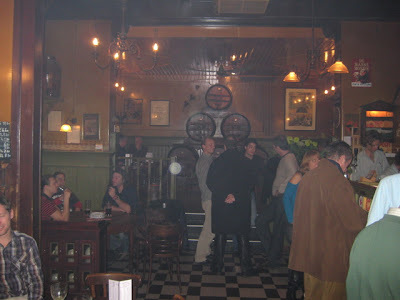 Then you go have some drinks in the tiny bar area. It can get pretty cramped. When your table is almost ready, the waiter will hand you some menus in the bar and ask what you want. You order then, and the food is then waiting for you at the table when you sit down. 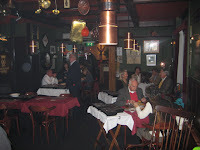 In the past, we always ordered the rijsttafel with cost €27.50 per person. It is a hell of a lot of food, though. A rijsttafel at Sama Sebo is 17 different dishes. It is possible to get a mini version of it. They pile just about everything on to one plate for €15. Ask for the "combo plate." But we decided to go a la carte this time and just get our favorites. 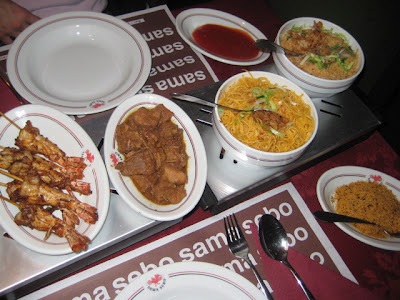 We got bami (noodles), nasi (rice), fried shrimp, toasted coconut, and pork with Indonesian soy sauce. 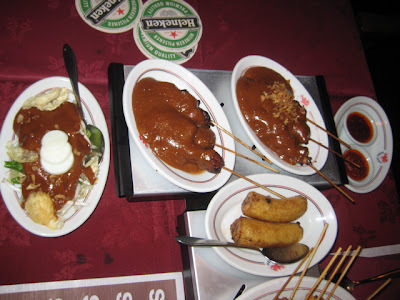 We also ordered chicken sate, pork sate, and gado gado (salad). I absolutely love the sate sauce at Sama Sebo. 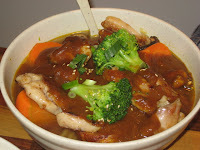 It is very thick and rich and sweet and spicy. They give you tons of it, and it is good to order shrimp crackers to dip into it. 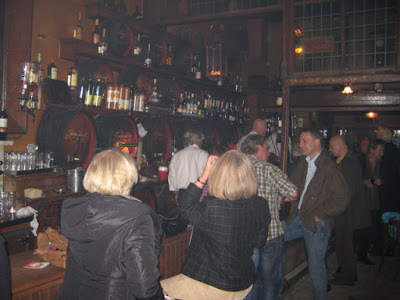 We had a couple of beers and a couple of glasses of wine and the total bill was 60 euros with tip. 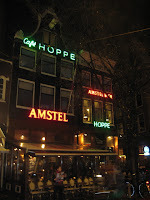 One of our favorite places to drink in the center of Amsterdam is Hoppe at Spui 18/20. There's been a bar here since 1670. It's small, narrow, dark, and smoky. Cigars are allowed. There is fine, white sand on the floor that is replaced daily. The crowd is a mix of locals and tourists. For us, Hoppe is just a place that feels comfortable and familiar. They serve Amstel at this bar. It's usually served in small .3 liter glasses for €2.20, but you can get a pint for €4.50. 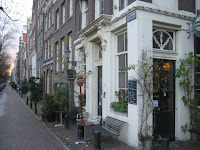 Another hangout for us, along the same lines, is Cafe t'Smalle at Egelantiersgracht 12. It is much newer than Hoppe, founded in only 1786. 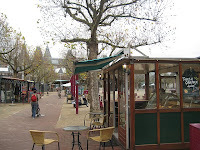 In the summer, there are tables outside on the canal. 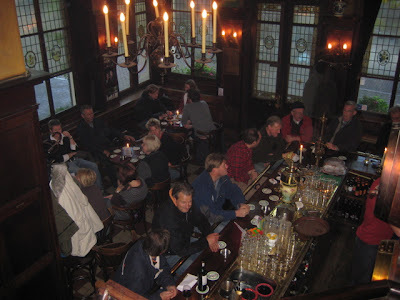 It was pretty crowded inside with locals on the cold and rainy afternoon when we were there. We were lucky and found a table up the steep stairs in the warm, paneled back room. Depending on the time of day, you can get lots of different snacks, salads, and sandwiches. It's not gourmet, by any means. 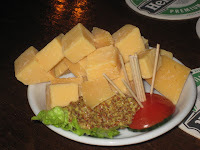 We love the "mature" cheese, which comes with whole-grain mustard. It's less than four euros and the sharp, pungent squares are plenty for two people. For a more beer oriented experience, I can recommend a place we stumbled upon for the first time on this trip. 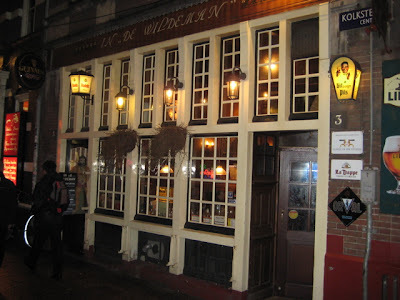 It is called In de Wildeman on Kolksteeg 3, between the palace and the Centraal Station. 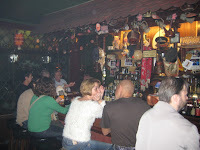 The bar boasts at least 17 different beers on tap and 200 different bottled beers. There is a list of the drafts written on the wall. They even have Kozel and Staropramen. But we didn't feel the need for any taste of home. We had Mahr's Weissbier. 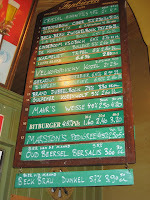 It was very good, but V said her favorite is still the draft version of Primator Weissbier that we get in Prague. 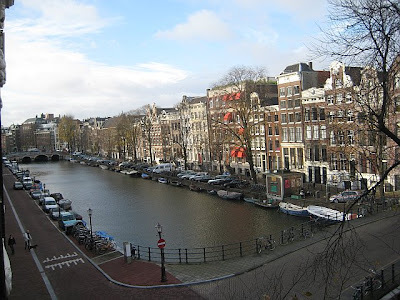 In Amsterdam, there are plenty of Asian restaurants to choose from, and there is a big concentration of them between the Red Light District and Centraal Station. 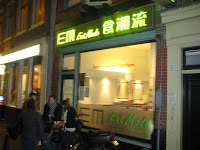 For something quick, good, and not too expensive, we often go to Eat Mode at Zeedijk 105-107, just a few meters from the Waag. It is very small, modern, and brightly lit. You can get a 360 degree view on the website. The wooden seats are not very comfortable. But it is not a place meant for lingering. 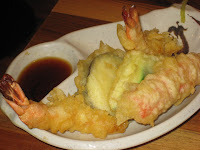 We started with shrimp and vegetable tempura (€5.50). The shrimp were good, the batter light and crunchy. A krab stick tempura was included. 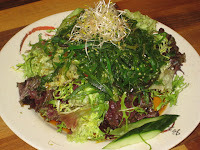 We also shared a seaweed salad (€5.00). It was large, with a sour soy-vinegar dressing. There were two kinds of seaweed, a very fresh and generous portion, sitting on a bed of lettuce. For a main course, I got a favorite -- barbecued Japanese eel with salad and rice for €10.00. This is a terrific bargain. 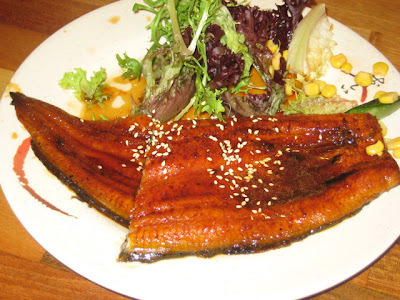 It is a large portion of unagi-style eel, at least 200 grams. V got Chinese noodles with "Japesnese curry" and chicken. It is a vast bowl, filled with long, thick noodles. Very filling and it only costs €7.00. A .3 liter bottle of Singha beer is €2.50. When we want to eat a lot of delicious Asian food for relatively cheaply in the center, we go into Eat Mode mode. For a quick snack, some Belgian frites in rolled up paper are available all over the place. Vincent Vega talked about drowning them in mayo, and V likes them that way, along with some ketchup. I always pay a little extra and get them with sate sauce. 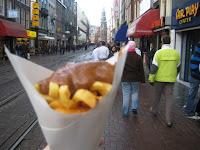 The medium frites with the peanut sauce on top cost me €3.00 at a place near Rembrandtplein. 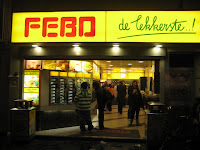 Another big Amsterdam memory for me is stopping at Febo on a cold winter day for a fried Indonesian-style croquette. 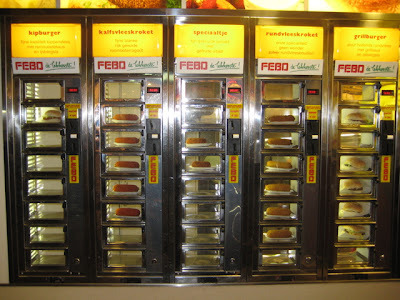 This place is an automat, meaning you put money in a slot, open a little window, and pull out the food you want. My all-time favorite is the Bami (€1.20). 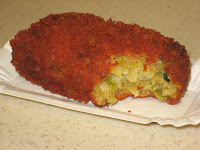 It is Indonesian spiced noodles in a square, greasy, crispy-crunchy-fried shell. There are plenty of other choices, and I tried many of them years ago, but the Bami is really the only one that does it for me. Perhaps a biggest and most favorite Amsterdam food, for both V and me, is the fresh, new herring (Nieuwe Hollandse) that is sold from little shacks around Amsterdam. There a couple around the Rijksmuseum, one near the Waag, one near the Koningsplein. There are a number of others scattered about the city. 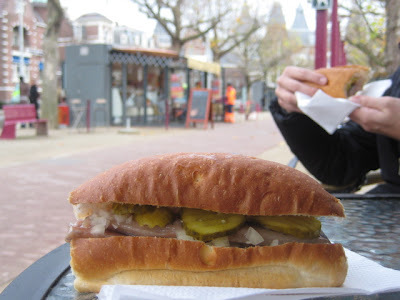 We always get the herring on bread (broodje haring) with chopped onion and sweet pickle. We got one of our first at a place between the Rijksmusem and the Van Gogh Museum for €3.00. We had one or two almost every day. The bread is very soft and undistinguished -- basically just a holder for this beautiful raw fish. 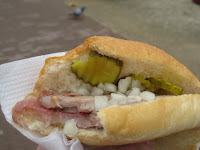 The only time we were served better quality bread was at a stand in Haarlem. That was perhaps the best, freshest herring ever. The herring can also be ordered without the bread or any extras, just cut up on a paper plate with toothpicks. Still, all the fish we had in Amsterdam was wonderfully fresh, soft and buttery, with just a hint of saltiness. I think of it as Dutch sushi and I enjoy it as much or more than any raw fish I have eaten in a Japanese restaurant. It's not so common, but people used to hang them by the tail over their mouths and eat them that way. And just because we were eating street food doesn't mean we could not have dessert. 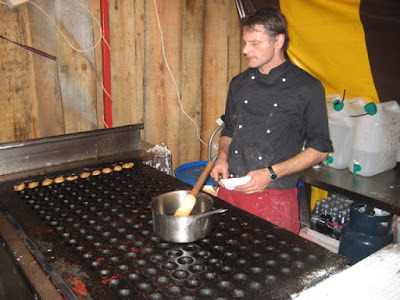 No trip to Amsterdam is complete for me unless I've had at least one plate of poffertjes. 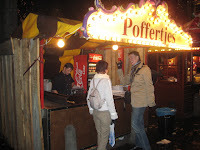 Poffertje stands are not so common anymore, but we did find this one set up on the Leidseplein. These small, coin-sized pancakes are cooked in oil on a specially indented griddle. There is a certain art to turning them all quickly with a fork. I wanted to make a short video, but the cook was too shy. 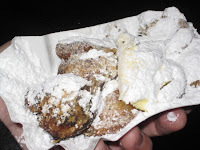 The hot little cakes are then topped with a large chunk of butter and then completely covered with powdered sugar. I blew some of the sugar off the top for a better view. They aren't so pretty, but fresh ones, soaked in butter and sugar, really are delicious on a cold night. This small batch was €4.00, which I thought a bit steep, but I would not let money interfere with my poffertje obsession. 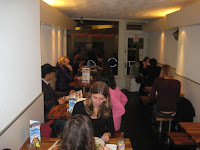 Perhaps it goes without saying, but we are always desperately full at the end of every visit. And let me tell you -- after a few drinks in a warm, paneled, candle-lit cafe, maintaining consciousness is no easy feat. man, this post comes in very handy, thanks a lot... I've been trying to get this kind of info for some time.. right on the nail! It is pretty old published article, so I hope you will read my comment. 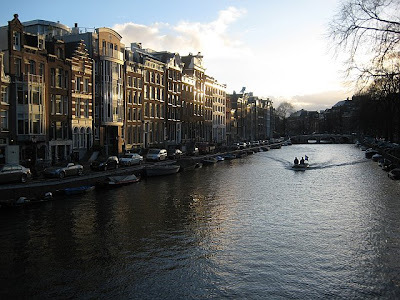 I follow your weblog quite well, and it is nice to read that you visit Amsterdam regularly. I live in Amsterdam and I visit Prague regularly. 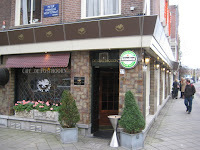 You know many people in Amsterdam, so most of the ´secrets´ will be known to you. But I like to point out one place. Brewery t IJ. You cannot eat there, just peanuts, cheese and salami. But, i think they have the best beers, specially Zatte and Columbus. Try to go there on a sunny day in spring or summertime. Sitting on their terrace and enjoying these beers and also the atmosphere. On a friday afternoon it might be too crowdy, but I think it is the best afternoon to visit. With these special beers, I think it is a good idea that they close at 19.30. I see all. Thanks for the tip. THose little pancakes remind me of abelskivvers (sp?). Yum yum!